Regular weekly yoga classes take place in a peaceful Tufnell Park/Kentish Town studio in the Camden area and are suitable for beginners and intermediate students. In the classes you will learn about relaxation, calming your nervous system, improving your posture, freeing your breathing. Above all you will develop a new awareness of your body and learn how to express the deeper meaning of the poses through the body in an artistic way. 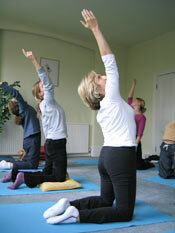 Newcomers can drop in for their first yoga class at any time. There are three 11 - 13 week terms a year. My aim is to provide a calm and quiet atmosphere in the yoga classes so that active and artistic work with the body can take place in a thoughtful way. I also take great care in giving each student individual attention. Classes booked ahead are reduced to £12 per class. New students book 5 classes ahead after their first class, if they wish to continue. Everyone else pays ahead per term, except for concessions.